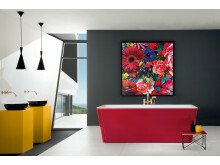 With its evolution into a lifestyle space, the bathroom is experiencing the return of color as well. The color transgressions of the 60s and 70s are forgotten – the main thing is to avoid boredom at all costs. 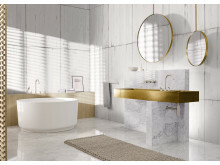 Bathroom Planners and the industry are responding to the desire for individually and boldly designed bathrooms with an ever-growing variety of finishes and unusual arrangements. 1. A modern bathroom with a long-life design: grey is a color too! The common color denominator in the bathroom right now is grey, although the composite color is actually no newcomer to the bathroom: like fashions, color trends come and go in waves, and we encountered it back in the 80s in the form of Manhattan Grey sanitaryware. Now grey is back again – but this time in several different shades with a more modern, timeless appeal. Grey inhabits in-between worlds and it’s precisely this “impure”, blended character that gives it such vividness. In vintage style, grey is extremely popular as a background shade because it makes even good old white look radiant without destroying the patina. All the negative associations with transience and bad weather seem to have been set aside: grey is a fashion color with a long shelf life. That’s because the blend of black, white and a dash of mystery is a genuine all-rounder that can complement virtually any color family. Besides light grey in all sorts of chalky variations, shades tinted with blue, green and brown (see Greige) are also very much on trend. You can actually create any kind of ambiance with grey – from ultramodern all the way to snug and cozy. That’s why grey can be recommended more or less unconditionally as the ideal starting point for neutral bathroom design. 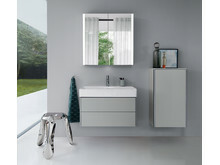 White sanitaryware looks just as good with grey furniture surfaces as color-coordinated washbasins do, and fittings with a standard chrome finish also go well with grey. With trendy accessories in gold or loud colors like red, yellow or turquoise, it’s easy to create fresh contrasts and paint a whole new picture, so to speak. As a result, it’s safe to say that grey has everything it takes to become the new white in the bathroom. The bathroom increasingly feels like cozy living space and on-trend colors like petrol or ultraviolet can be used to reinforce that impression. But interior designers tend to favor natural colors, which are both warmer and more neutral – the kind of colors that are mainly found in the palette of brown and sand hues. However, the new shades of brown have nothing to do with the old familiar color known as Bahama Beige – on the contrary: the browns available nowadays add up to a thoroughly modern world of color. Because similarly to grey, there’s just one simple rule: anything goes – as long as it’s not boring or devoid of nuance. The secret lies in the subtle tints and shades. Brown can contain hints of mud, clay or terracotta, olive, bronze or rust, pine forest or cedarwood, powder or taupe – the possibilities are endless. There are two main options for interpreting brown in a contemporary way: either as a color spectrum inspired by nature, often used in combination with natural materials to create a harmonious color space or as an artistic reference to historic styles. Matt surfaces are a popular choice for underscoring the fresh, natural look. And when it comes to materials, wood tops the list of frontrunners for creating a bathroom with a snug feel. Whether it’s used for the wall, the countertops or the floor, there’s a perennial favorite for conjuring up a pleasant, feel-good atmosphere: oak, preferably with a finish that reflects the current trend towards a light ambiance. On the other hand, elegant arrangements featuring darker wood hues from cognac all the way to bog oak are coming in again, especially among the avant-garde.In this case, the brown color scale is used in an emphatically upmarket way to add a hint of art deco and luxury to the modernist bathroom. No matter what style is preferred, however, the question as to which materials to use is often resolved by means of simulation: shower trays, floor tiles or splashbacks printed to look like wood and countertops made of composites skilfully imitate nature and combine it with the positive material properties of the established product canon.Up-to-the-minute brown hues can transform any bathroom into a lifestyle space, especially when combined with suitable accessories in complementary accent colours – like the petrol shade mentioned above, turquoise, orange, a beige-tinted dusky pink (or Millennial Pink as it’s now called), ultraviolet or the odd dash of mustard, which looks great with olive and brown shades. Gold is one of the most precious metals of all – and, as a finish and color, it’s currently a firm favorite for creating an interior design with a lavish, sumptuous touch.Then there’s brass – a related color that’s also very much on trend right now, and a commonly used material in traditional bathrooms.There’s great demand for metal surfaces in general, of course, and in the bathroom, it’s mainly met by fittings and accessories, which are now available with all sorts of metal finishes thanks to the new processes manufacturers are using.But while platinum and copper are also popular, gold is in a different league: where bathroom design is concerned, it’s becoming an absolute highlight.Besides washbowl basins that are occasionally even coated with real gold leaf, wall coverings are also a good way of bringing the precious metal into play in the form of special wallpapers or paints that create the velvety shimmer and subtly textured look of pure gold.However, just like the real precious metal, gold surfaces make the greatest impact when they’re not overused.Gold is never the sole color in the interior design concept; instead, it’s often used in conjunction with black or dark shades of green and blue.But combinations with light, natural colors, grey and – surprise: delicate pink! – also, make for successful bathroom design. Now there’s a statement: a black bathroom!It seems as if the on-trend white-on-white look (not to be confused with conventional bathrooms tiled in monotonous white, simply for lack of a better idea) is facing serious competition in the form of black-on-black – paired, of course, with highlights in white, gold or other snazzy colors.While individual components have always been chosen in black occasionally, it can now happily be used for several elements in the modern lifestyle bathroom.The trend comes from the interiors sector and is finding a growing number of fans in the bathroom too because black looks upmarket, elegant and modern all at once.Mixed with white, black or particularly trendy green marble and leather, black is a tasteful classic, whereas when it’s combined with painted metal furniture, wood, and concrete it’s an ideal companion for the industrial style.And thanks to the perfection of new production processes, even fittings manufacturers can accommodate demand and are now offering a choice of dark shades that range all the way to deep black.From black shower enclosures and black bathroom furniture to floor-standing washstands in black enameled steel, almost every bathroom product is now available in this classic “non-color”.And the addition of a few splashes of color – the bolder the better – sets the black bathroom off to perfection.Just like white, black is available in a vast array of different nuances.But even a design in one consistent shade of black can be given a certain je ne sais quoi by combining matt and glossy surfaces.And by the way: the simple charms of black don’t only appeal to men – the very deliberate distinction to the light colors favored by the mainstream is something any fan of black will appreciate. In color theory, “chroma” represents the purity of a color’s hue. Accordingly, the purest colors are the spectral colors, which have maximum saturation – the kind of colors children love drawing and painting with.Family and preschool bathrooms vary this vibrant look to create a pleasant atmosphere that appeals to the respective target group.But now, bright colors are also being very deliberately used as a design element for lifestyle bathrooms.This approach means turning traditional visual habits upside down and working with several very dominant colors.Color gradients?Forget it! Instead, bold colors and contrasts are used to make a clear statement that advocates more optimism in life.And while the bright bathroom might look playful, it’s definitely not naive.Instead, it represents an act of defiance in the face of miserable prospects, the kind of “when-if-not-now” attitude that’s emerging in creative circles and expressing itself in the form of unaccustomed and totally uninhibited combinations of colors and patterns – especially in the fashion world.But trendy and original colors will make themselves felt in the bathroom too – and in this trend, it’s primary colors that set the agenda.Besides intense shades of red, yellow, green and blue, that also includes options like warm orange, mysterious violet, and smart amber yellow.Even at this ISH, visitors will already be able to see bathrooms in provocative colors – from washbasins in loud shades all the way to transparent bathroom furniture in blue and green: a top bathroom trend. Anybody who wants a suspenseful color combination without the loudness of the bright bathroom should consider trying the ultimate discipline of colorful bathroom design: the combination of several colors to create a harmonious overall effect.Color chords, i.e. combinations of several colors of the same intensity and quality, are probably the most challenging option – but also the most individual.This could take the form of, say, a mustard yellow sofa with blue and putty-colored cushions set against a blue wall.Like fashion, such color chords are a matter of taste, and they tend to meet with a far more enthusiastic reception elsewhere in the interiors segment than they do in the bathroom.But when they’re done right, they create a subtle, tasteful, multicolored look that turns any bathroom into a highly original gem.Still, when it comes to bathroom design, arrangements that comply with certain types of color harmony tend to meet with greater consensus.Colour harmonies can be created out of neighbouring hues (e.g. blues and greens), by using only “cool” colours (like blues and violets) or only “warm” shades (orange, yellow, red) or by combining chromatic and achromatic colours (e.g. various shades of blue combined with several shades of taupe and grey).The goal is to achieve an optimally balanced composition that is perceived as pleasant, and the colors are usually selected on the basis of color wheels or color cubes. Color chords and color harmonies are possible in all color ranges.What’s important when it comes to designing a bathroom is that one color sets the tone while three to four others are used to underpin the harmonious impression.Every single nuance matters, and choosing the right products and materials is extremely challenging for the bathroom planner. Various programs and apps are available for helping with the selection of suitable colors (e.g. Capture CC from Adobe or Colourpin II from NCS). Tone-on-tone concepts bring a sense of serenity to the bathroom even when bold colors are used.But even though one color dominates the color scheme, monochromatic interior design is rarely confined to the homogenous use of a single color; instead, the surfaces are gradiated in different shades and nuances of one hue. Even without contrasts, this gives rise to a subtly differentiated impression of depth that is extremely expressive thanks to the monochromatic palette. A change of materials can also be used for gradiation – be it a certain shade of stone or wood that harmonizes particularly well with the basic color or different surface texture that results in deeper shading.Tone-on-tone concepts are a tried-and-trusted design concept in fashion too, where simply using several different materials is enough to create elegant ensembles, for instance by combining wool, patent leather and leather in one and the same shade.By contrast, the focus in interior design is on achieving the necessary differentiation between surfaces.And because smooth, uninterrupted surfaces are playing a prominent role in interior design right now, with detailed products being contrasted with large expanses of color, tone-on-tone concepts are currently very much on trend, especially in kitchen design.This color trend can, therefore, be recommended for the bathroom too, especially when a modern look is required because color gradations can create differentiation and an impression of depth even in smaller rooms.A blue bathroom, for instance, can play with different shades of blue without being a strain on the eyes; even so, it will create the impression of a completely blue room as long as there are no stark deviations or brightness contrasts as compared with the main color. The result is like “a blue grotto”, “a green jungle”, “a pink powder compact” or “white infinity”, but nevertheless rich in spatial differentiation – and in view of the sensory overload we’re confronted with in our everyday lives, the effect is a veritable tonic for the soul. 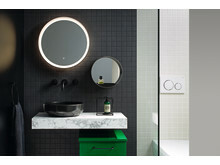 Two developments are fostering the trend towards a bathroom dipped in green. Firstly, the longing for natural surroundings in which nature is perceptible as humankind’s primordial home.And secondly, green is a trending color that creates a wonderful mood – especially when combined with plants.What’s more, a combination of different shades of green is relatively unproblematic.Solitaires like a freestanding bathtub can be used to make a statement, and the color space can range from a mysterious dark green for an upmarket, comfortable bathroom all the way to a fresh May green – a great choice for young families. What’s more, green is an excellent basis for telling intriguing stories, for instance when combined with big patterns, floral wallpapers, photo wallpapers and a little jungle of plants that will add an exotic touch to any bathroom. Pastel shades are a big interior design trend right now – mint, pale pink or light blue look welcoming and can be used to create color accents.Pastel bathrooms conjure up a pretty new world – sometimes trendy, sometimes fanciful, but always with a dash of escapism.In short, they’re a great place to start the day!Combining pink with brown elements – perhaps a light wood floor or tiles – underscores the cozy look.In the bathroom, these modern-looking colors are mainly used for the outer surfaces of bathtubs or washbowl basins.But the wall behind the vanity unit is also a great canvas for giving the bathroom a fresh boost.Light pastel shades are particularly suitable for small bathrooms because they make space seem bigger, especially when paired with large-format tiles and plain walls.The effect works particularly well with grey, which is no doubt why the combination of pink and grey – often bordering on silver – is probably one of the most popular color harmonies for the bathroom right now.And powdery dusky pink used in conjunction with white and grey is nothing short of romantic. These days, it’s impossible to imagine the color palette of modern architecture and interior design without it: greige evokes nature and country houses, but it also looks a bit like the floor of a New York loft apartment.It goes just as well with a playful vintage look as it does with a minimalistic industrial style.The neologism greige is an amalgamation of grey and beige and thus stands for the dominant color principle in this bathroom trend: a composite color as a modern, neutral basic shade with an extremely harmonizing effect.Greige exemplifies a category of colors that enter into a permanent alliance with a second color and create something new.Just as greige is made by mixing grey with light brown, it’s also possible to mix grey with blue (which tends to result in a cooler look).The positive attributes of greige can be put to particularly good use when designing a cozy bathroom.And if the furniture finishes are perfectly coordinated with the walls and floor, the overall effect is as modern as it is snug. Like grey, greige, therefore, has what it takes to become the new white in bathroom design. Blue is probably the most popular color of all in European countries.We associate blue with relaxation, the vastness of the sky and life-giving water. Color providers have greatly modernized the palette of blue shades in recent years, resulting not just in innovative colors for the wall but in new variants for tiles that create a cozy effect as well, and the interior design world’s rediscovery of marble is encouraging the use of blue sanitaryware.Combined with sand hues, blue creates a style related to the popular Scandinavian look, and anyone looking for an alternative to the hip black trend can opt for sumptuous ultramarine instead.The more vibrant the shade, the more luxurious it looks. White stands for purity.That’s why it’s been dominating bathrooms for decades and serves as the basis for a wide range of design approaches.45% of Germans swear by the timeless, universally combinable basic color, giving it a huge lead over beige (11%), grey (10%) and blue (8%)*.In many cases, it’s chiefly the ceramic sanitaryware, as well as mineral cast washbasins or bathtubs and shower trays, that form the basis of the color scheme.The underlying idea is totally understandable: the products are meant to be the shining stars of the bathroom for as long as possible – both with regard to hygiene considerations and in terms of color.More than 80% of the ceramic sanitaryware sold in Germany is white, so it’s very convenient that white happens to be so popular in interior design right now.In the meantime, sanitaryware producers have added different shades of white to their offerings, although these new variants are still having a hard time asserting themselves.The best way to bring out the design qualities of the white sanitaryware is to combine it with colorful accessories and a welcoming overall look.Contrasting it with colorful bathroom furniture or floor tiles is also a clever design principle that’s guaranteed to banish boredom.A classic black-and-white design, for instance, is a less eccentric alternative to the ultra-hip black bathroom – and no less stylish. The fact remains that, even if only because of the high investments involved, the bathroom will probably never number among the rooms that are revamped every few years in line with the latest color fashions. All the same, a little bit of color is never a bad thing! And if you ask design-savvy target groups, a little bit more is even better. Whereas minimalistic restraint was considered the epitome of elegance and design awareness in recent decades – especially when it came to the color scheme – today it’s the willingness to embrace color that counts. At the same time, using color in the bathroom doesn’t necessarily mean colorfulness – just swapping the dominance of white for a neutral spectrum of brown and grey tones, composite shades or brighter tone-on-tone concepts is an evolutionary step towards turning the bathroom into a lifestyle space. 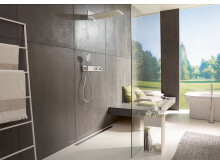 Pop up my Bathroom, an initiative of the German Sanitary Industry Association (Vereinigung Deutsche Sanitärwirtschaft e.V. [VDS]) and Messe Frankfurt established in conjunction with the ISH, is an experimental platform for architects, bathroom planners, interior designers, and journalists. It aims to explore and illustrate what possibilities the bathroom can offer people as an aesthetic and functional space. On the one hand, it gives experts a chance to find out about new developments, on the other hand, it aims to convert the designs it develops into pictures that will be understood all over the world. The website www.pop-up-my-bathroom.com has therefore been expanded into a continuously updated blog that serves as a communication platform and has attracted almost 1 million international visitors. Until the next ISH opens its doors, it informs professionals and interested consumers not just about the Pop up my Bathroom trends but about the latest developments in various segments of the sanitary industry as well.